The study comes as California endures its third driest year on the 106-year record, and as agricultural, urban and environmental demands for water are at an all-time high. 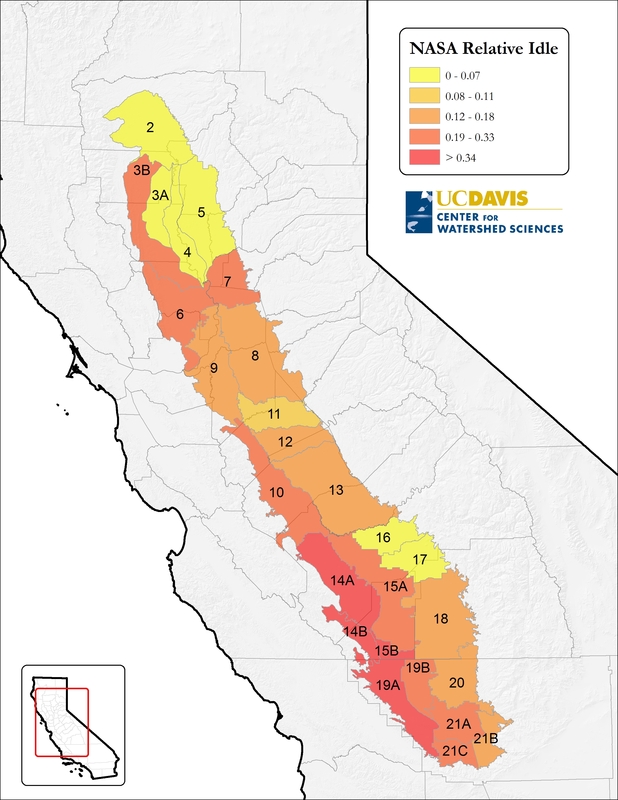 Based on surveys of irrigation districts and modeling results, growers will lose about 6.6 million acre-feet of surface water availability for 2014 because of the drought. However, additional groundwater pumping is expected to make up for about 5 million acre-feet or 75 percent of the loss. This shift to groundwater, particularly in the Central Valley, will increase the proportion of farm water supplies from groundwater to more than 50 percent, up from about 30 percent the previous year. The resulting net water shortage of 1.6 million acre-feet will cause losses of $810 million in crop revenue and $203 million in dairy and other livestock value, plus additional groundwater pumping costs of $454 million. These direct costs to agriculture total $1.5 billion. The total statewide economic cost of the 2014 drought is $2.2 billion, with a total loss of 17,100 seasonal, part-time, and full-time jobs. The 2014 drought is responsible for the greatest absolute reduction in water availability for California agriculture ever seen. In addition, two of the major drought coping mechanisms in California — groundwater pumping and water markets — are being used with little information gathering on their long-term consequences. While our aggregate measures of groundwater depth over time and space are often good, our estimates of regional groundwater use are lacking. The lack of groundwater pumping information precludes most forms of regional groundwater management. Water markets also are operating in a largely informal manner with reports of extremely high prices being paid throughout the Central Valley – prices at least three times those seen in the 2009 drought. The absence of a central clearinghouse for water-trade information prevents normal market information on current prices and quantities from being available to buyers and sellers. 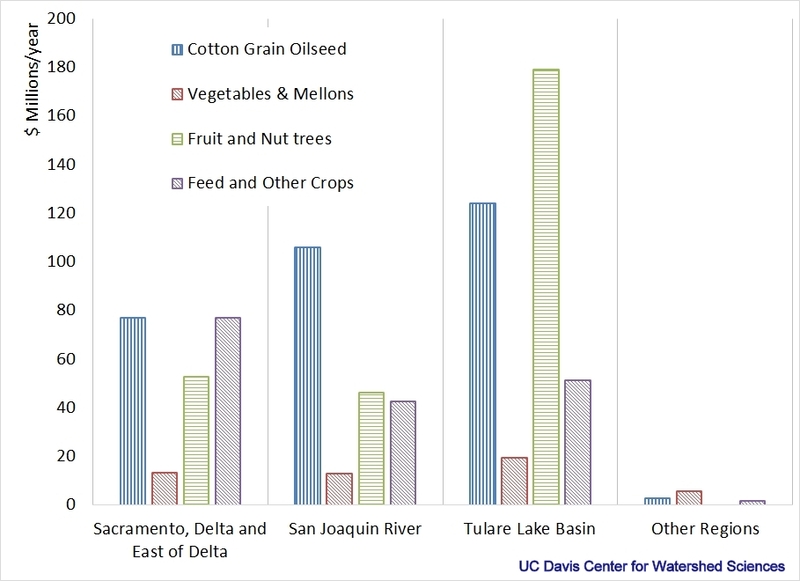 Thanks to groundwater use and water market transfers, the overall California agricultural economy is weathering the worst drought in decades remarkably well. But the resilience is tenuous because the state’s uniquely unmanaged system of groundwater use runs like an unlimited savings account. 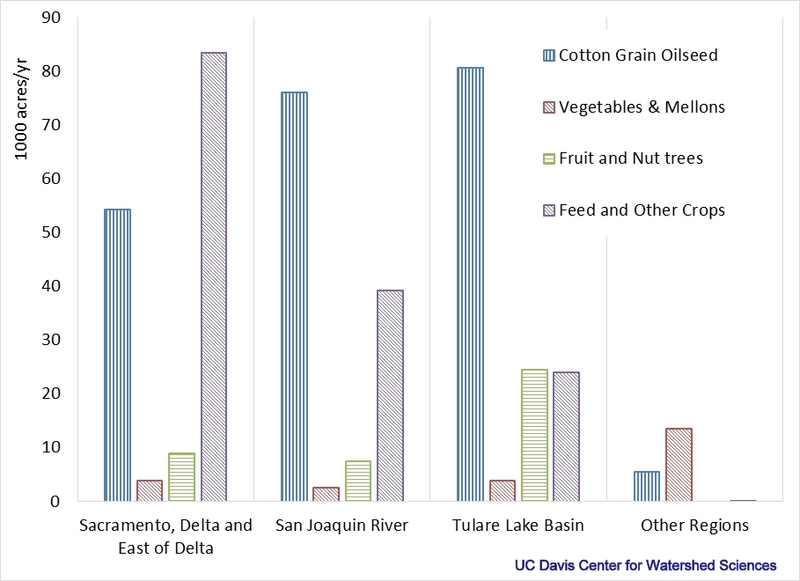 Failure to balance the checkbook – replenishing groundwater in wet years – is putting the nation’s produce basket at risk, particularly California’s more profitable permanent crops such as almonds and wine grapes. 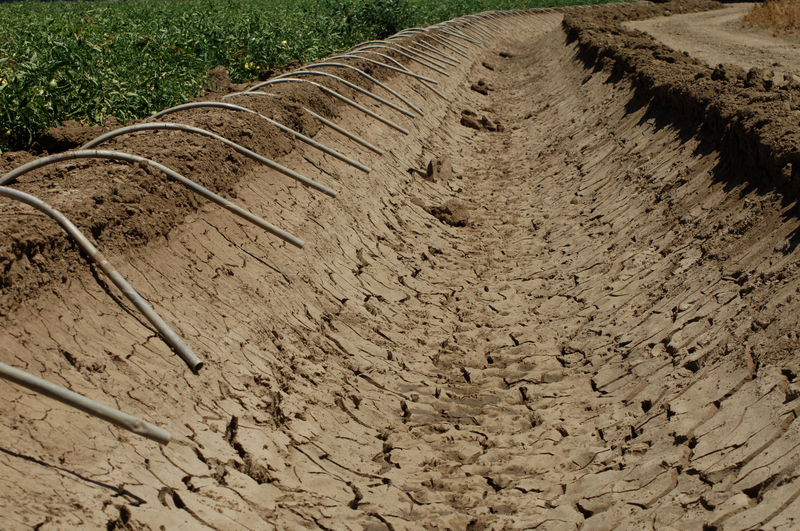 Groundwater availability and use is the key to agricultural prosperity in droughts. Statistically, the drought is likely to continue through 2015 – regardless of El Niño conditions. If the drought continues, groundwater substitution will remain the primary response to surface water shortage. But the ability to pump groundwater will lessen and pumping costs will climb as water levels fall. A continued drought also increases agriculture’s vulnerability. Urban water users are for the most part adequately stocked this year, but they are likely to buy water from agricultural areas if the drought persists. Groundwater measurement and management. Currently California is the only western state without measurements of major groundwater use. A first step to local groundwater management — as opposed to groundwater regulation — is to measure pumping. Two bills under consideration in the state Legislature would provide incentives for more management of groundwater, helping to assure support for crops during a drought. Environmental Impact Reports for water trades. Water trading is another key to successful drought management. Some water trades can induce adverse environmental impacts, so EIRs are needed. However, environmental concerns should not be used to block trades for non-environmental reasons. This happened to several proposed water trades during the 2009 drought. A policy solution is to define a programmatic EIR for water transfers that can be assessed prior to a drought. If the pre-drought EIR is approved, then the transfer can proceed, with any subsequent damages adjudicated after the fact. This policy change would lower the costs of water transfers and provide greater predictability and flexibility during a drought. A water trade clearinghouse (or ISO). The surface water distribution system in California is an interdependent network of individually run canals, reservoirs and rivers. Coordinated operating agreements and contracts exist among some agencies, but moving water efficiently under drought conditions could be improved. California’s water system has parallels to the state’s electricity grid system before its reorganization. Today, California’s electric power is routed and dispatched with a market and prices managed by an Independent System Operator (ISO). A similar water ISO might operate to improve adaptability and responsiveness (Hanak et al 2011). It would take significant federal and state level political impetus to implement a similar system for water, but it remains a promising policy innovation. We should further develop drought water markets to re-distribute water to crops with the highest economic value while compensating selling farmers. And we need to treat groundwater like a reserve bank account so it will be there to sustain our agricultural bounty in future droughts. Richard Howitt is a professor emeritus of agricultural and resource economics, Josué Medellín-Azuara is a senior researcher and Jay Lund is a professor of civil and environmental engineering with the UC Davis Center for Watershed Sciences. Duncan MacEwan is with ERA Economics in Davis, Calif. They are co-authors of the report, Economic Analysis of the 2014 Drought for California Agriculture, which was released July 15, 2014. Ames Research and CSU-Monterrey Bay. This entry was posted in Uncategorized and tagged agriculture, drought, Duncan MacEwan, Jay Lund, Josué Medellín-Azuara, Richard Howitt, water management. Bookmark the permalink. “Weathering the drought by drawing down the bank”? Hear, hear. Measure pumping. As burdensome and necessary as a reporting system might be, a simple statute to require releasing power company records of KWH used to run the pumps would be an easy stopgap by the legislature. Am I correct in my understanding that it was the scientists at Davis that initially encouraged grape growers in California to abandon dry farming of wine grapes? Might they reverse their recommendations considering the changes in climate to come? Alas we have another fail to report or consider the environmental or structural damage to our groundwater holding capacity possibly because the primary source of the problem and university’s prime funder are one and the same. Subsidence is a real issue and problem that may lead to greater and or more frequent earthquakes. Subsidence causes damage to utilities such as gas pipelines, water lines and other water distribution systems. Excessive agricultural demand for water is the primary cause of this destruction and it will continue to manifest as long as the state continues to allow unfettered access to our groundwater. The collective, excessive overdrafting of the groundwater is an unconscionable act that must be dealt with now. Groundwater extraction in the Central Valley must be made transparent and available for the public to see. Why should farmers be the beneficiary of water markets? I would like to see a study on the value of water contract “rights”. Since CA granted perpetual water rights to the development of land by farmers, what is the value of the land for farming vs selling future water – forever? Combine this question with the inheritance tax advantages we grant to farmers. Unlike the rest of us, the family farm has a “special use” calculation for valuing estates so the “family business” can be passed on without much tax burden. This means the value of all future snow falling 100 miles away accrues to the land owner and continues generation after generation tax free because great great grandfather homesteaded near a river. If the estate had to account for the value of this water and pay for the publicly funded dam upstream or the tunnel bypassing the delta, then I might be convinced they should share in the water market. Otherwise, a new model is needed for a water market in the CA economy. This story is misleading with its references to banking and checking accounts which allow you to move, restore and even increase funds with only administrative charges. Water storage capacity is lost with subsidence and cannot be effectively recovered regardless of how much you pay a water purveyor. The financial analogies are inappropriate and something that would be expected from a political bent. I would expect more scientific accuracy from a University report but considering it was funded by CDFA does explain the Agricultural Marketing and Public Relations approach. We will work with anybody, but we work for nobody, even if they pay us. All the work, especially the policy recommendations, are our own. You will find our other writings on groundwater, land subsidence, and markets to be of interest. You also might find some background reading on water in California to be informative.